UA bondable, flat wire for retention of tooth position. 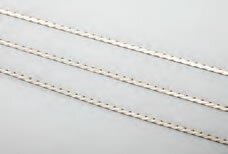 Designed for ductility similar to 8-braid retainer wire. Now available in 6" and 60" lengths! Compression, or Open Coil, springs are used to create space between teeth. Compressed during placement, the spring then exerts continuous force against the teeth as they return to original length. NiTi compression springs are available in both Variable and Superelastic forces. As further explained in Spring Basics, the tooth-moving force of variable force springs gradually decreases over the activation range. The tooth-moving force of superelastic force springs remains near constant over the activation range. To accommodate your doctors’ preferences, we offer a wide variety of variable and superelastic springs with force levels from light to heavy. Made of premium Nickel Titanium wire. Provide continuous forces throughout activation. Virtually no permanent deformation with proper usage. Wide range of forces available. Compression Springs 7 inch lengths (3 per tube) and 15 inch spools. X Indicates available from stock. Force graphs of Nickel Titanium Extension Springs may be found in the Our Support section. The greater the wire size, the higher the force. The smaller the inside diameter (lumen), the higher the force. The shorter the length (# of active coils), the higher the force. Our quality extends beyond our parts, with superior service and support.